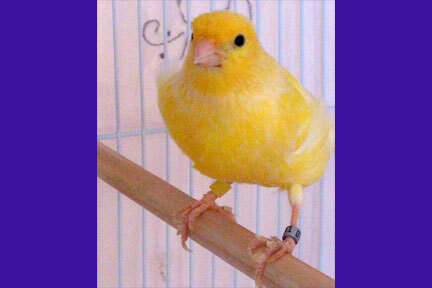 If you look back at my post on December 30 of last year, you’ll see my spotlight article on canaries…and more specifically on Tweet, the canary we fostered for a friend’s mother. Well…it turned out we did get to keep Tweet as our own and we had a great time together right up until St. Patrick’s Day night when I said goodnight to him, and “Love you Tweet,” for the last time before adjusting his cover and turning out the light. I’d already promised him a morning filled with veggies and egg biscuit and he’d been chomping on seed a moment earlier. I didn’t know it then but this was our, “Until We Meet Again,” goodnight. Yesterday was a rough day…as my husband said to me, “How can such a tiny bird leave such a big hole.” And especially after only six months with us. But it’s true. Today, after visiting a family of dogs on a farm, I got back into the car and pulled out my Irish Penny Whistle. I played and played (no one can hear me out there) and a few pieces weren’t half bad but mostly it was really awful. But I felt good afterwards. That’s when I realized the huge lesson my little yellow bird taught me. As the song says, “Let it Go.” I have a tendency to try to do things precisely, if not perfectly. I would never play my whistle in front of anyone. I would listen to a few songs at home but never dance around to Roar or Shake It Off, or Boogie Woogie Bugle Boy…and I sure as heck wouldn’t try to sing along or play along (especially when the whistle is tuned to a different key entirely!) In the old days, I would practice for a few minutes alone and hear the flats and squeaks and misfingerings and end up disheartened. Tweet taught me to Live, Laugh, Love the way no one else could. We’d both be out of breath and smiling by the time we were done. He didn’t care if he didn’t know the tune…he only knew he heard music and joined in. Yesterday, I wondered if I could ever face the whistle again after losing Tweet…so I forced myself today. And it was good. After everything we had together, it would have been be a terrible shame to take what he taught me and hide it away again. For now at least, I’ll still keep my dancing and whistling to my own audience, but I won’t worry about hitting wrong notes or not harmonizing properly. I’ll play from the heart and enjoy the moment. Just as I did with Tweet. We as pet sitters have the most amazing opportunity to connect with the animals we see every day. But do we? Do we really? If there is any all-encompassing realization Tweet has left me with, it’s that every one of us, human, dog, cat, or bird…all have something within them to share with us. We just have to be willing to open our eyes and hearts to hear the message. Thank you Tweet. I love you and I miss you.